Sunday morning talk show guests are still, overwhelmingly, very white, very male and very conservative, according to a new report from Media Matters for America. White men continue to dominate the guest lists on the major networks' shows, with the single exception of the Melissa Harris-Perry show. Six of the seven shows analyzed -- This Week, Face the Nation, Fox News Sunday, Meet the Press, State of the Union, and Up -- have hosted white men at a significantly higher rate than their 31 percent portion of the population. Melissa Harris-Perry provided the greatest diversity among guests, providing a much higher rate of white women and African-American guests than the other programs; Up also hosted a higher percentage of people from those demographics than CNN or the broadcast programs. 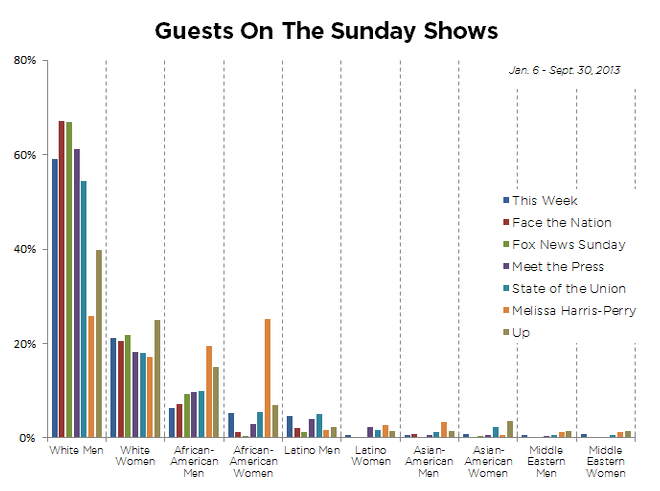 Latino, Asian-American, and Middle Eastern guests have been largely absent from the Sunday shows. Native Americans fared even worse, with only two appearances (one on Melissa Harris-Perry and one on Up) out of a total of 2,436 appearances over the nine-month period studied.